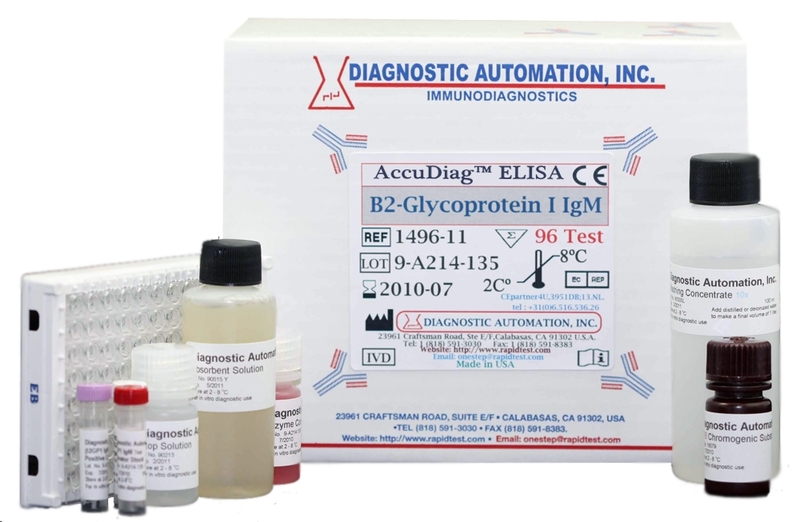 Beta 2 Glycoprotein 1 IgG ELISA kit | CE-GMP | 818-591 3030-USA. 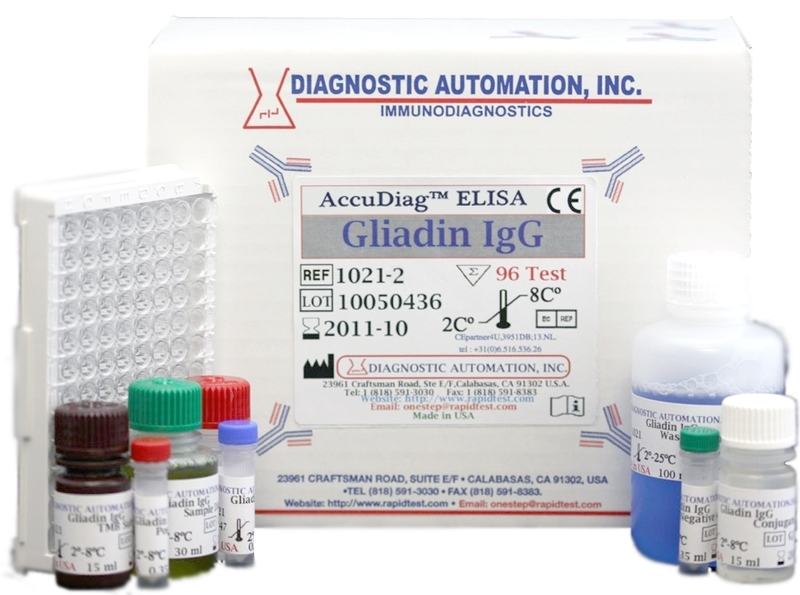 The Diagnostic Automation Beta2GP1 IgG Enzyme-linked Immunosorbent Assay (ELISA) is intended for the detection and semiquantitative determination of IgG antibodies to B2GP1 in human sera or plasma. The results of the assay are to be used as an aid in the diagnosis of certain autoimmune disease thrombotic disorders, anti-phospholipid syndrome, SLE or lupus-like disorders. Purified Beta2GP1 antigens are coated on the surface of microwells. Diluted patient serum or plasma, and calibrators, are added to the wells. The Anti Beta2GP1 specific antibodies, if present, bind to the antigens. All unbound materials are washed away. After adding enzyme conjugate, it binds to the antibody-antigen complex. Excess enzyme conjugate is washed off, and TMB Chromogenic substrate is added. The enzyme conjugate catalytic reaction is stopped at a specific time. The intensity of the color generated is proportional to the amount of IgG specific antibodies in the sample. The results are read by a microwell reader, and compared in a parallel manner with calibrators.. For additional details please refer to the instructions for use. Product inserts for all Autoimmune ELISA kits follow a similar method. 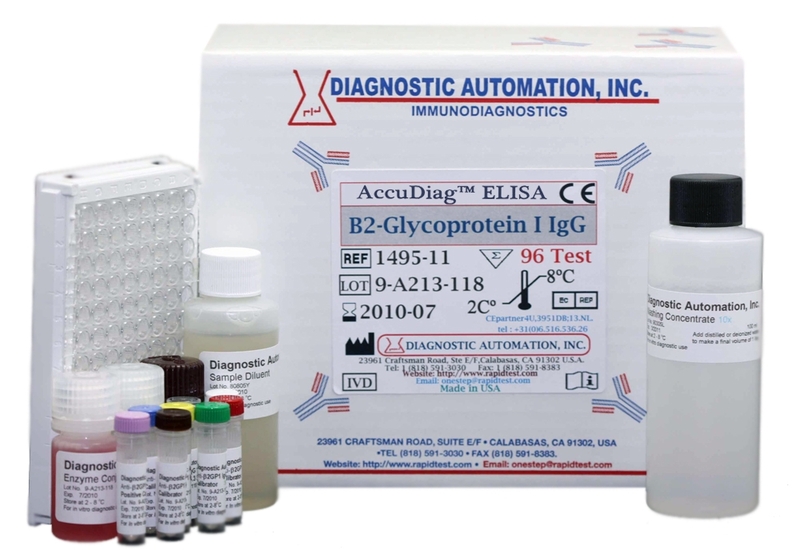 See the Beta2GP1 IgG ELISA Kit product insert for specific details on preparation, procedures, quality control, and test result interpretation.